Law, I. (2008). Savvy. New York, NY: Dial Books for Young Readers. If you could have a savvy, what would you want it to be? It’s no secret that the Beaumont family is odd. Each member of the family upon turning 12, discover their “savvy”, their magical secret. Mother is known for always being perfect, grandpa can move mountains, one of Mibs brother Fish creates hurricanes, her brother Rocket has electricity, grandma can trap musical radio waves into jars, and now it’s Mibs turn. What type of savvy will she get? Mibs is excited to learn what her savvy will be. She dreams of being able to fly or shoot lasers from her eyes but now that Poppa, two days prior to Mibs big day was in a terrible accident and hurt, all Mibs wants is a savvy that can save his life. 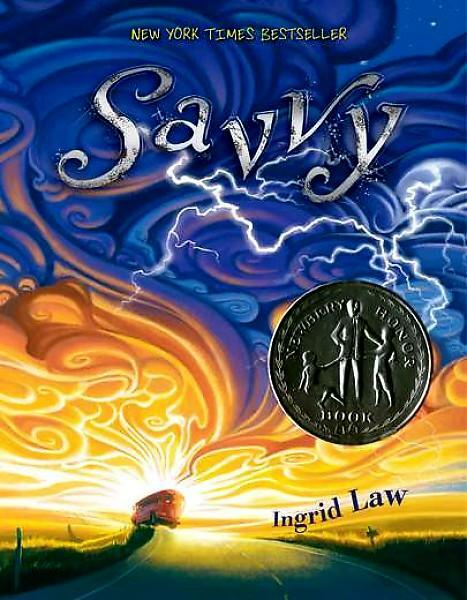 Savvy by Ingrid Law takes the readers on a ride in an old salesman’s bus as the Beaumont children, try to reach the hospital there dad is at. Particularly Mibs is determined to prove to her father that her new savvy whatever the savvy ends up being that she will be able to save him. Read what happens to Mibs as she discovers her savvy, and the crazy adventure she goes on to help her papa. Mibs journey to save her father is a lot of fun and leads to many new discoveries for all involved, including a Bible salesman, a preacher’s boy, a diner waitress, and many of her Savvy siblings. The language of the book is absolutely entertaining chalk filled with tons of nonsensical southern sounding dialect words such as; “hobbledehoy boy”, “fizgiggley girls”, “persnickety moment”, “niminy-piminy thing”, “razzmatazz radio”, “full hokeypokey”, “marching herky-jerky”, “a jig shy of jaybird-naked”, “oom-pah-pah polka music”, and “heebie-jeebies”. The books can will easily be appreciated by many with the setting is in the Midwest, the nice treatment of religion, and the ever so strong focus on family. Savvy should easily appeal to more readers than just fantasy readers. There is a sequel to Savvy, Scumble, set nine years after Mibs journey, her cousin, another Beuamont has just turned thirteen and about to get his savvy, a savvy more powerful than anyone could have ever anticipated.